Obwohl unser Haus mitten in der Natur und ruhig gelegen ist, brauchen sich unsere Gäste nicht abgekapselt fühlen. Es ist nur ein Katzensprung nach Mittenwald, Garmisch-Partenkirchen, Seefeld oder Innsbruck. Und auch München ist nur eine gute Stunde entfernt. Although our quiet house is located in the middle of nature our guests do not feel encapsulated. 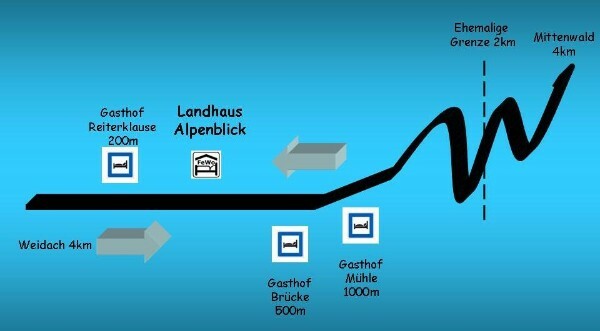 It is just a stone`s throw to Mittenwald, Garmisch-Partenkirchen, Innsbruck and Seefeld. And Munich is only an hour away. You are able to visit us by car, of course - Free parking permits you to leave the car during your holidays. Und so finden sie uns über Google Maps. And so you will find us with Google maps.